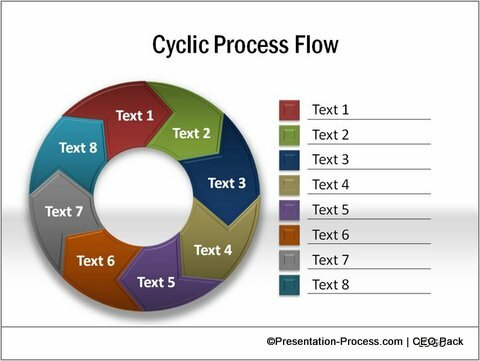 Discover 5 creative ways to make your Process flows interesting in PowerPoint. It need no longer be text based or boring, no matter how complex it is. We have all at one time or the other seen flowcharts like this – created with small fonts that are impossible for the audience to read. They also look so complex, that audience may just give up trying to understand what it is supposed to explain. It is tough for the presenter as well, as they need to represent a lot of data in 1 slide. So how do show all that you need to show, without turning off your audience? 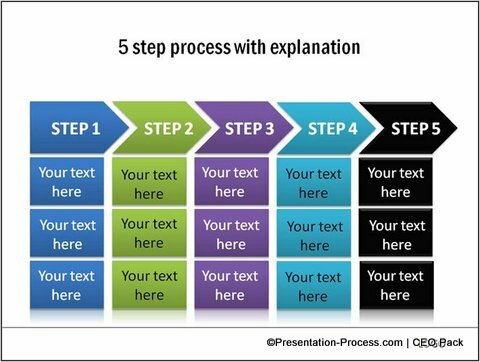 Here are 5 ways in which you can make it easier for your audience to understand such flowcharts in PowerPoint without losing the presentation flow. 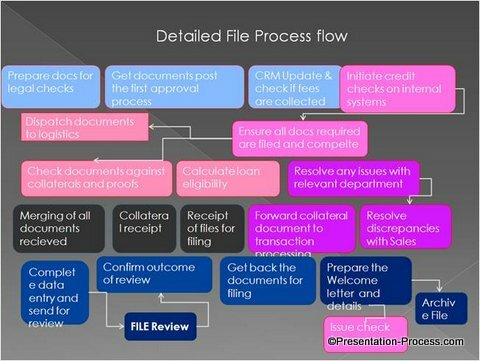 Break up the flow chart over multiple slides and use Push left transition between slides to make it look like one seamless flow. Set this up by selecting the process slides and then going to Animations> transitions to this slide > Push Left Animation. If you want to, you can print the flowchart out and provide it to your audience as well so they can actually read it. 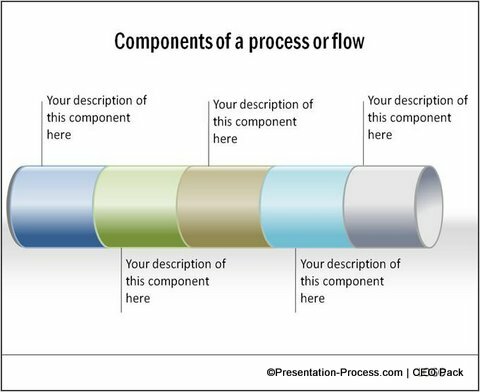 If your process can be broken up into groups, then group the items of the flow chart and first show an overall flow. You can then show details of each part of the flow. 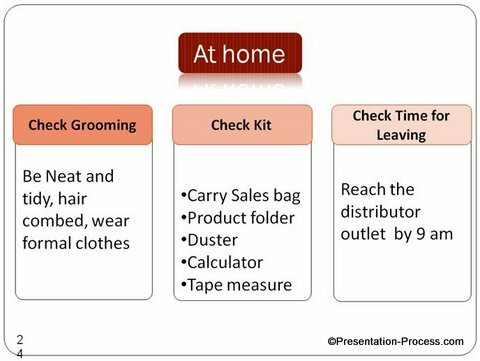 For example, the set process for sales call by a company person to the retail distributor can be broken up into 3 parts. If each step of the process is really important, it helps to illustrate each step with a small professional icon. This is used especially when the process is not too long and complex. Adding icons when the slide is already full just serves to clutter up the space. 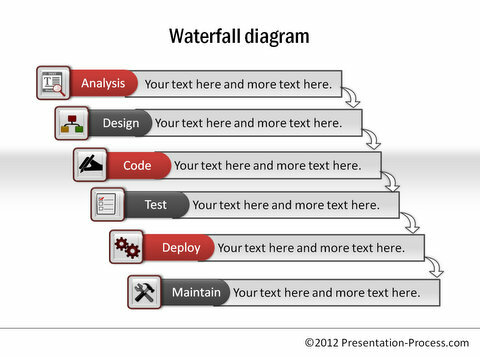 Can you see how adding the icons made the PowerPoint process stand out from the usual slides? Use a metaphor or analogy to make the slide interesting and the concept easy to remember. 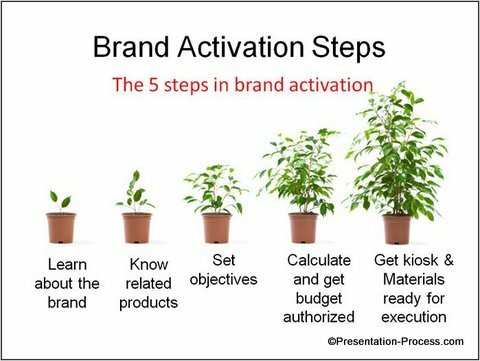 Here is a simple example of 5 steps of brand activation. While the same thing could be represented as bullet points, this is far easier for the audience to recall. 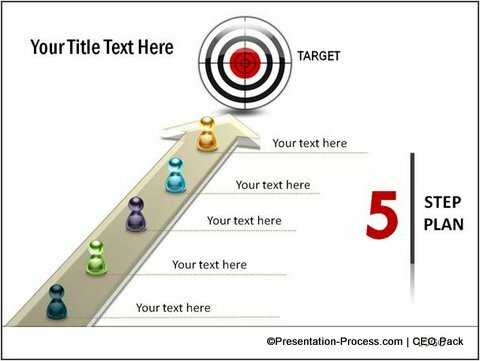 This is the best possible alternative, especially if the process is a critical part of your presentation. By using custom animations, you are going beyond just visuals. You are actually creating an experience for your audience. The animation need not be complex, simple entrance and fade animations can represent your processes easily. Here are examples from our 750+ charts and diagrams pack of different creative ideas. You can visualize and create these ideas yourself or get the ready to use pack and save the time and effort. Example: Use animations to represent the ideas. In this case, the idea of input—processing-output is shown with animation. The changing colors of the glossy globes indicate the change after the process. As you can see there are many ideas you can implement if you just think and present any process more creatively. Look around this section to find many more creative ideas.